To Kill A Kingdom is Alexandra Christo’s debut novel and is a dark and exhilarating The Little Mermaid retelling full of adventure, danger and slow developing and understated romance. Siren Princess Lira is revered across both land and sea as the Princes Bane, a vicious killer whose preference for the hearts of princes is well known. As the daughter of the Sea Queen, Lira knows her destiny is to one day take over the throne, until an act of rebellion against her mother sees her turned into the very thing she hates the most; a human. The only way for Lira to return home and to her true form is to bring her mother the heart of the sirens biggest enemy. Prince Elian is known as the golden prince but it’s his title of Siren Killer he treasures the most. More comfortable at sea on board his ship the Saad than he is at court, Elian and his crew are at home on the ocean, hunting sirens and ridding the world of the ruthless monsters. When Elian rescues a drowning woman from the middle of the ocean, he knows she’s more than she appears but he could never expect her true nature. Elian is Lira’s ticket home but as her time on two legs begins to change her, will she dare wish for more than the war that simmers between their two races? And will Elian learn to trust the very thing he hunts? Or will a shared enemy be the destruction of them both? I have to admit I had some misgivings heading into To Kill A Kingdom. Seeing as the novel was set to unfold through the eyes of a self-proclaimed monster and murderer, I worried I would struggle with connecting and enjoying the novel…..but boy was I wrong! 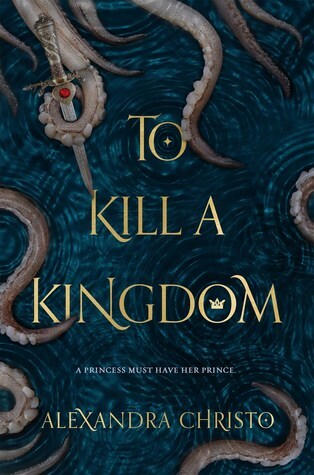 Alexandra Christo has created a very luscious and entertaining retelling with To Kill A Kingdom and manages to hit every nail on the head; action, adventure, character development, entertaining dialogue, romance. I felt the whole novel was very well rounded and well written on Christo’s part. Unfolding through both Lira and Elian’s POV’s, To Kill A Kingdom is a very entertaining story. Based on the traditional Little Mermaid tale, Alexandra Christo gives it darker twist featuring sirens and pirates while also enjoying the elements that make so much fun to begin with. Allowing readers to witness the story unfold through both Lira and Elian’s eyes makes for a well-rounded tale—you are in on the secret of who Lira truly is while Elian is oblivious. You can’t help but desperately read waiting for everything to be revealed. Female protagonist Lira is a stubborn and fiery soul who undertakes so much growth within the story to overcome her upbringing and nature. I genuinely liked Lira even when she was still a murderous siren; she was sharp tongued and quick witted, something she finds she shared with male counterpart and second protagonist Elian who is both prince and pirate. I loved the dialogue Christo shared from Elian who is very much the charming pirate and who is both hero and scoundrel. He was a fun male lead who often made me laugh or brought a smile to my face. As you would expect, romance plays a role in the building storyline of To Kill A Kingdom, but it’s not as prominent as you would think. Ultimately Lira’s feelings for Elian play a big part in some choices she makes but the relationship between them is only a small part of the story, blending effortlessly with the adventure and excitement throughout the novel. It’s highlights include the sharp and smart quips and teasing comments shared between them and the understated connection that develops overtime. I actually felt their romance was perfectly written within the story and wouldn’t have had it any other way. Building to course changing altercation between our main characters and the Sea Queen, To Kill A Kingdom is a fast paced and solid standalone tale with a great cast of supporting characters. Alexandra Christo offers to YA audiences a well-rounded debut that doesn’t disappoint and guarantee’s she’ll be an author I’ll have my eye on moving forward! Final Thoughts: Thoroughly adventurous and highly enjoyable, I very much enjoyed To Kill a Kingdom and am keen to see what Alexandra Christo releases next!